Remove the Accept-Encoding header from the request. The browser will probably send Accept-Encoding to indicate that it can cope with gzipped or deflated content, and leaving this header intact would encourage the upstream server to send a compressed message body, making it slightly harder to rewrite the response later. This simple Rack app doesn’t yet modify the content of pages at all, but it already does a decent job of proxying the site without too many problems. Thankfully most of the navigational links on GOV.UK are relative, so the browser often stays at the proxy hostname rather than navigating away to the real site; conversely, almost all of the asset URLs are absolute, so the images and stylesheets get loaded from the real site without burdening the proxy. Synchronising their scroll positions was the easiest part. The scroll event fires whenever a window is scrolled, and window.scrollTo can be used to set the current scroll position, so I could just use Faye to broadcast scroll events and recreate them on other devices. This is enough to reproduce the scrolling behaviour of the controlling browser in each of the mirroring browsers. Manually setting window.location.href in the controlling browser (rather than allowing the default click event behaviour) has the desirable side-effect of forcing any awkward links (e.g. target="_blank") to open in the current window. url = url.route_from(GOV_UK_URL) if url.absolute? The RewriteRedirects middleware turns absolute GOV.UK URLs into relative ones so that the browser stays on the current host. If the redirect URL points at a non-GOV.UK site, the response code is changed to 204 No Content to prevent the browser from navigating anywhere. I couldn’t find a GOV.UK page that uses history.replaceState, so I ignored it. At this stage the implementation was complete enough to deliver, but I wanted to make it more robust by keeping track of the current URL and scroll position on the server so that any new client (e.g. a rebooted iPhone or iPad) could be sent straight to the right page instead of having to wait for a user interaction to trigger an update. This automatically freshens the server’s state if it gets restarted for any reason. Add a caching layer: The proxy application is wasteful in its network usage, re-fetching GOV.UK pages on every request. In practice this didn’t introduce enough latency to be problematic — the GOV.UK site is very fast, and the browsing speed was limited by the museum’s internet connection rather than how fast the proxy could produce responses. Run a separate Faye process: Faye runs in the single Thin process that’s also running the Rack proxy, which might cause contention under load. In practice there are only three browsers talking to Faye, so this doesn’t cause any detectable slowdown. Run multiple Thin processes: The Rack proxy can only serve a single request at once, so throughput could be improved by running several processes and distributing load between them. Again there was no obvious need to do this; the three clients were acceptably responsive when talking to a single Thin process. A subsequent discussion with Chris Roos made me realise that writing a Chrome extension could’ve made the controlling side easier to implement: I might have been able to listen to events through the Chrome APIs (perhaps chrome.tabs.onUpdated and/or chrome.history.onVisited?) instead of trying to do it all in-page. Ultimately the controlling browser ended up being a generic WebView inside a kiosk application anyway, so a vendor-specific extension wouldn’t have worked, but I’d investigate this option more thoroughly for any similar projects in future. This project took about two days, including time spent on the initial brief and the physical installation of devices at the Design Museum. 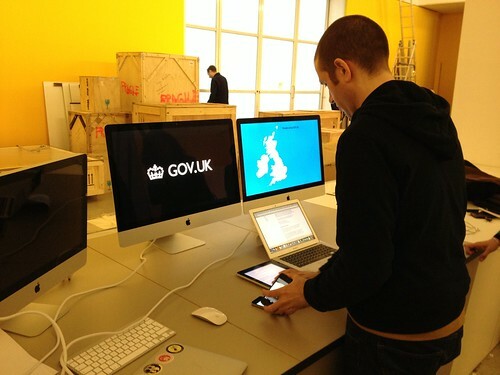 The GOV.UK site is well-built and makes proper use of web technologies and conventions. Its judicious use of GET requests, 302 redirects and fragment identifiers makes it straightforward to synchronise views of the site across multiple devices. Even the decision to use relative rather than absolute links made it significantly easier to get a simple tech demo running before I’d done any work on handling external URLs. GDS employs talented people and empowers them to move quickly and get things done with a minimum of hassle. Ben Terrett and Alexandra Bobbe were clear in their brief, quick to respond to questions, and constantly available for testing and experimentation; Paul Downey spun up an EC2 instance for this project as fast as I could email him my public key. Rack is a powerful abstraction with a rich ecosystem of off-the-shelf components that are easy to plug together. Although Rack::Proxy isn’t perfect, it works well enough to be adapted to this purpose, and saved me the trouble of writing any hairy Net::HTTP code. The middleware concept makes it easy to incrementally improve a bare-bones app until it does everything you need. Most significantly, a Rack app does exactly as much or as little as you tell it to, so there is zero time spent wrestling with a framework. Faye is an exceptionally good open source project, consisting of a high-quality implementation backed by high-quality documentation. It was effortless to install and worked first time; when I wanted to do something more advanced, its author James Coglan was immediately responsive to questions on Twitter. It’s extremely satisfying to work with the wind at your back like this. I enjoyed this project a lot, and in future I’ll be more likely to come back to these technologies (and these people) when I want to make something fast and fun. The 2013 Designs of the Year exhibition runs from 20th March until 7th July. Good luck, GDS — I hope you win. Update ( 16th April ): They did win! Published at 4pm on Tuesday 19th March 2013 .